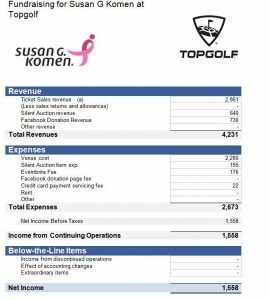 Team 1 set up a fundraiser raise awareness/funds for Susan G. Komen foundation. 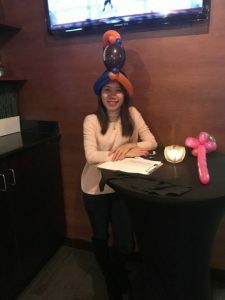 In order to raise money and awareness for the organization we hosted an event and silent auction at Top Golf in Wooddale, Illinois. 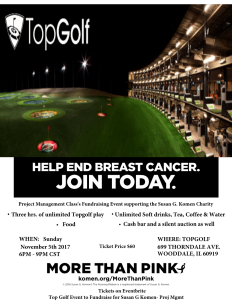 Tickets were sold at $60 a person were $45 would go to Top Golf and $10 a person would go to the charity. We also had a Facebook page were 100% of the donation would go the charity. The silent auction at the event had sports memorabilia and Blackhawks tickets available to be bid on. 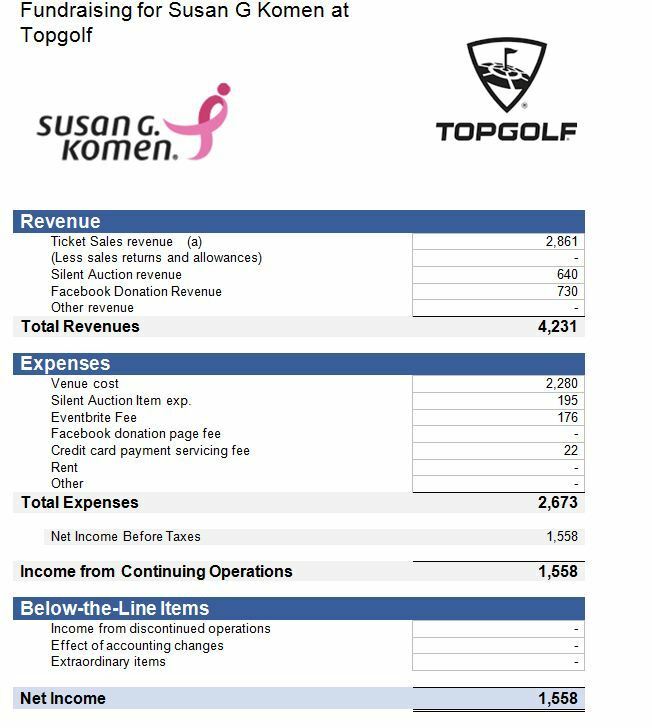 The charity/ organization that Team 1 selected was Susan G. Komen. 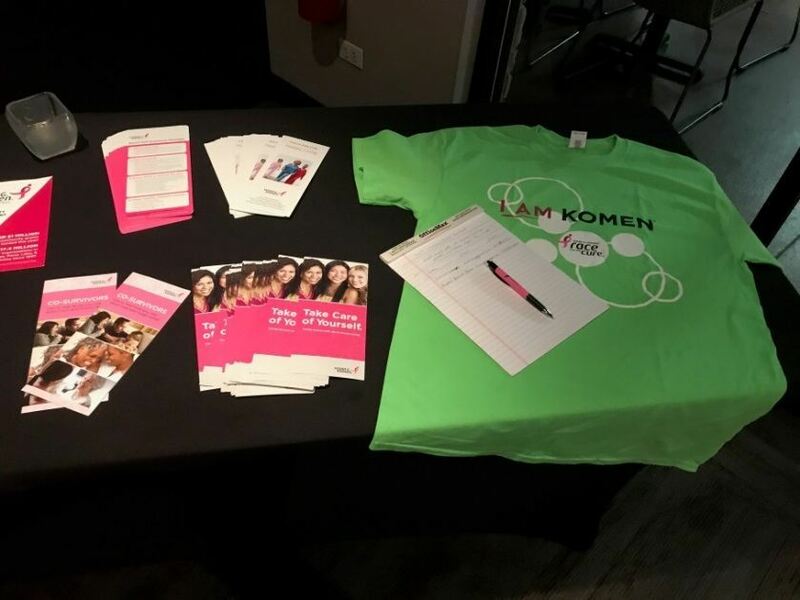 Susan G. Komen has been working in the United States for more than 25 years providing comprehensive education about breast cancer risk factors, early detection and screening, diagnosis and treatment to millions of women in need. Their mission statement has been “to save lives by meeting the most critical needs in our communities and investing in breakthrough research to prevent and cure breast cancer”. They have several different local programs and initiatives. The impact has been tremendous as they have been able to reduce breast cancer mortality by 38%. 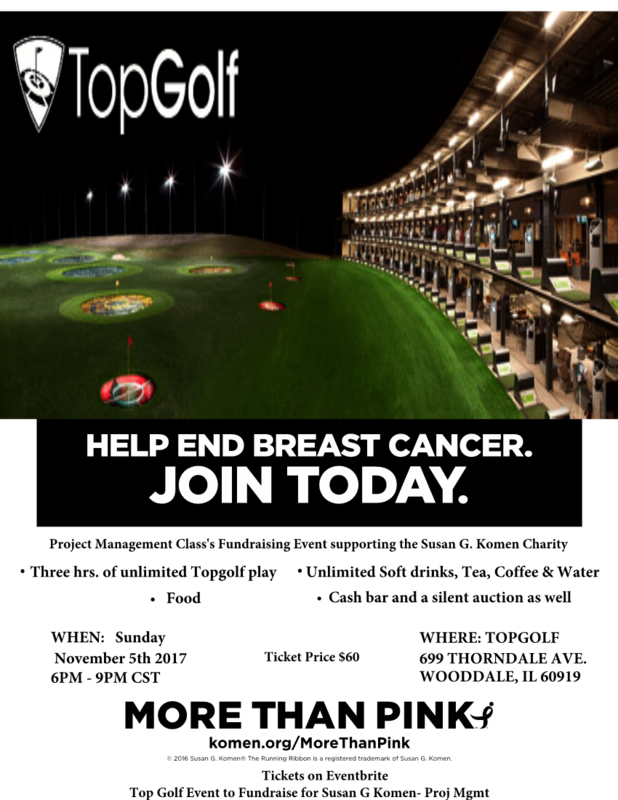 Our goal was to raise a total of $1,300 from our event at TopGolf and Facebook donations page. We were at a disadvantage with the high cost of the event, and the event being on a Sunday night, but we believed that we would be able to hit 60 people for the event because TopGolf is a popular venue and Susan G Komen is a very well-known organization. We also wanted to raise awareness for breast cancer, and to do this we wanted to bring a speaker from Susan G Komen to talk about all that this charity does. As you can see from the above breakdown our fundraising events were a success. We were able to raise a total of $1,558. 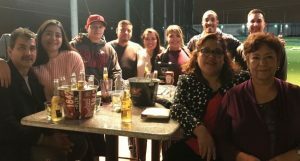 We also had a member of Susan G Komen come out to our event and speak about breast cancer and other events that the charity has. 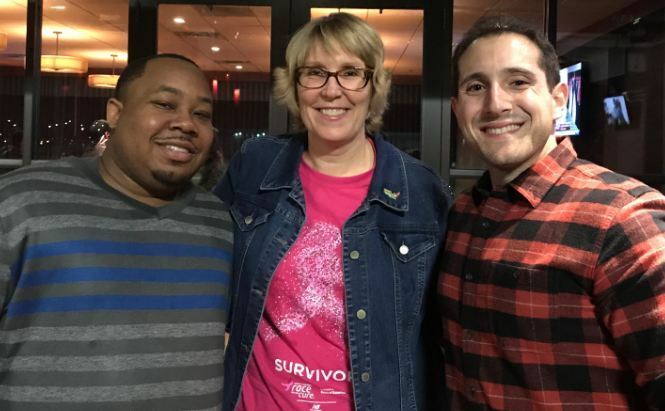 There were also individuals at the event that are going to be donating some of their time to help Susan G Komen with the grant writing process. Planning is Key: When planning a project, we need to step back and take a look at the big picture. Plan for every possible contingency, and think the project through. Since our project had really high venue costs, we failed to think through how we were going to fund those costs. We were going to get revenue from ticket sales, after the event but we had to pay for the venue before the event. Half of it was due, couple of weeks before the event to book the venue, and the other half was due a few days before the event. We scrambled to get the deposit together and then for the final payment, our PM was nice enough to pull that together for us until our revenues came in. It would have been really helpful if we had planned for the huge payments ahead of time. Delegation of Work: You have probably heard it, if you want to get something done right, do it yourself. That probably isn’t the best advice for managing a project effectively. Proper delegation of duties, keeping everyone’s strong suit in mind is quintessential part of planning a project. 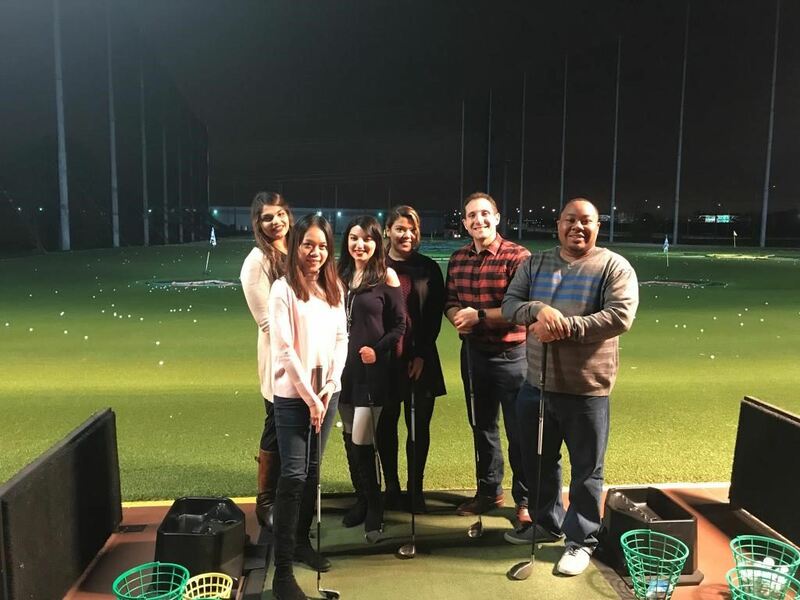 Our team, being a cohort knows everyone and recognizes their particular abilities that they excel in. Our team worked as a well-oiled machine, because we were able to delegate the work among the team members, no one was stuck doing everything or the hard things on their own because we were there to support each other. We were also able to avoid any disagreements. Fair workload amongst the team members: Workload should be fairly distributed amongst the team members, to avoid animosity, to stay focused and get the best possible outcome. No one person can do it all, and the task becomes exponentially easy when you have 6 minds working at it instead of one. Take advantage of every team member’s strength and share the success and the failures. Positive Attitude: Positive attitude and fix it approaches instead of pointing fingers is necessary for a project to be successful. There are bound to be mistakes and this is meant to be a learning experience. We should be mentally prepared for damage control and fixing the situation when things do not go as planned. Playing the blame game, does not help anyone, only makes a bad situation worst. Effective communication is Key: The importance of effective communication cannot be stressed enough. Our team used multiple communication methods, which included in-person meetings, emails and Instant messages. When working in teams, it is important to understand that everyone is at a different mental level, and going through their own personal obstacles. Clearly communicating the expectations helps everyone be on the same page, and work towards the same unified goal. We were able to do it you can do it too. Always plan ahead and plan for contingencies. Keep everyone involved and take advantage of their strengths. Don’t leave anyone behind, if a team member is falling behind on deliverables; ask how you can help out. Keep a positive attitude; everything is doable, if you work as one solid unit.